A few days ago, my husband comes rushing in the house and says "We have Mallards in the pond". Now, we have a collie. Collies like to heard things. We have fish in the pond. Ducks eat fish. 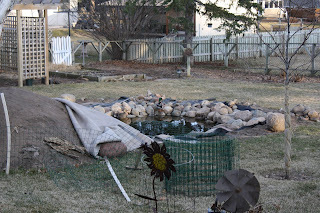 So, you can see where I'm going with this...while ducks in our pond would be really neat, it is NOT a smart idea. They let me get quite close, I kept creeping up on them. She was getting a little nervous, but he was intent on grooming himself.